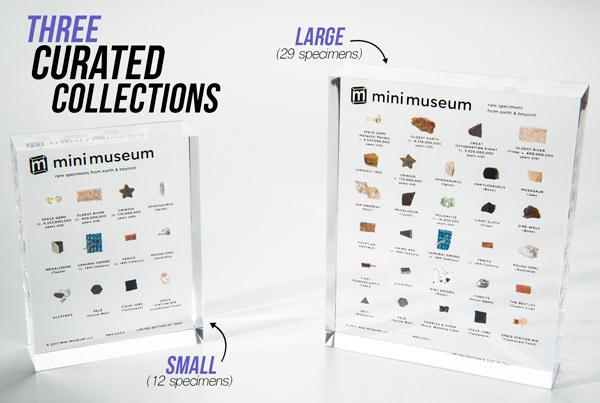 Mini Museum: Rare and historically significant specimens encased in acrylic. Have you ever seen rocks as old as Earth itself, been awed by the natural power of a tooth from the mighty megalodon shark, gazed at the ingenuity of a 10th century Viking axe or a 14th century Samurai sword, or considered the historical significance of a soccer ball owned by Pelé or Steve Jobs's iconic turtleneck as you held them in your hand? The Mini Museum gives you the privilege to explore some of the most significant pieces of history closer than you'd be allowed as a visitor to the most renowned museums in the world. The Mini Museum is a complete collection of curated curiosities artfully arranged for display and appreciation. Ranging across both space and time, these rare treasures define snapshots that tell the past of the universe, the natural history of Earth, and the story of humanity's great achievements. 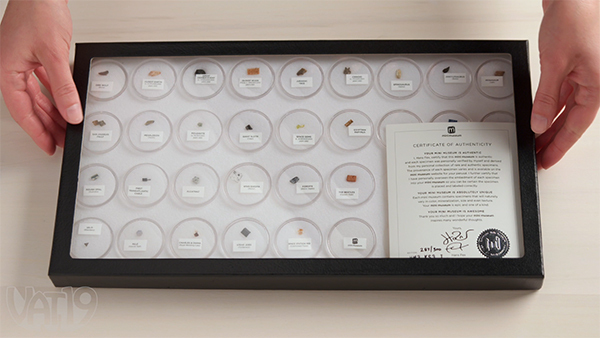 The limited edition selections of artifacts include tiny pieces of some of the oldest, rarest, and most interesting materials on the planet (and even off it) in display cases designed to show their beauty. 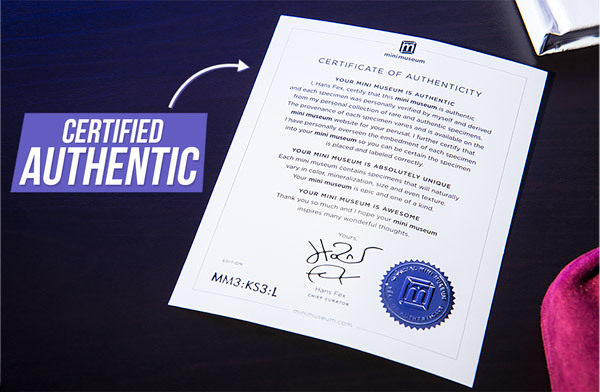 The portable museums include certificates of authenticity so you know you're getting genuine objects and a full-color bound companion guide to explain the significance of the item and the specific details of the included specimen. Collection of rare and historic specimens. Museums are fascinating places to visit, but it's not always convenient to go out and see 'em. 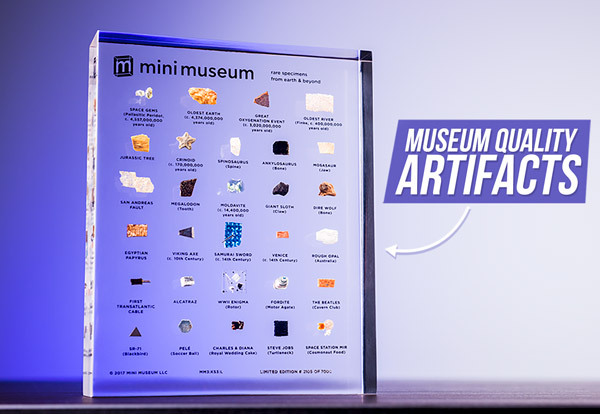 Mini Museums are micro-sized versions of the palaces dedicated to curating artifacts of cultural, historical, and scientific importance. Rather than marble halls, the collection of specimens are arranged inside transparent plastic in a form small enough for you to touch. Even though the fragments of each object are tiny enough to hold in the palm in your hand, each item is such a big deal that they've changed the course of history. The Mini Museum is open to the viewing public 24 hours a day. With such an impressive collection of specimens gathered in one tiny arrangement, you'd expect the artifacts to be reproductions, replicas, or downright fakes. In reality, each specimen has a verified authenticity of provenance and has been certified as a genuine article. Way more enlightening than a Wikipedia article. A museum's purpose, beyond mere preservation, is to inspire and educate. 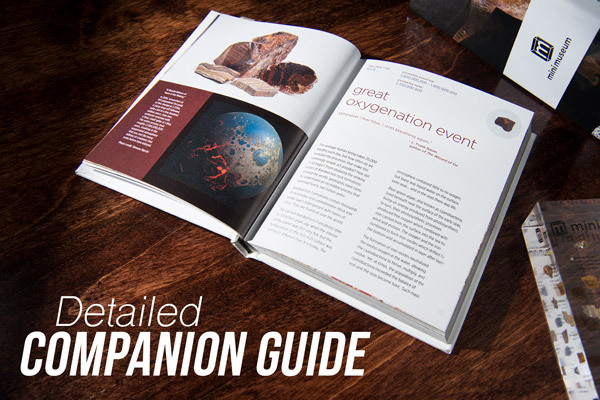 The objects themselves will provide the inspiration while the full-color printed companion guide will educate you about their importance. The 160-page, hardbound volume features a section on each specimen and describes both the story of the item and the story behind each sample fragment. Each collection includes the companion guide. Please hold all questions until the end of the tour. The Mini Museum is available in three form factors. The 12-specimen and 29-specimen versions encase the artifact fragments in a solid block of lucite for optimal viewing and protection. 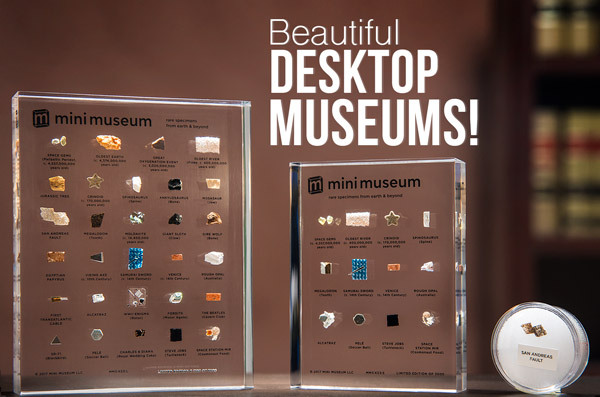 If you prefer a hands-on approach to history, the touch version includes a hinged desktop shadowbox with the same 29 specimens as the large lucite version. See with your eyes or, if you prefer, your hands. 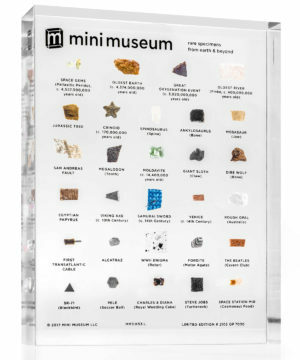 The Mini Museum touch version gives you a unique opportunity to reach out and grasp some of the most important objects of all time. 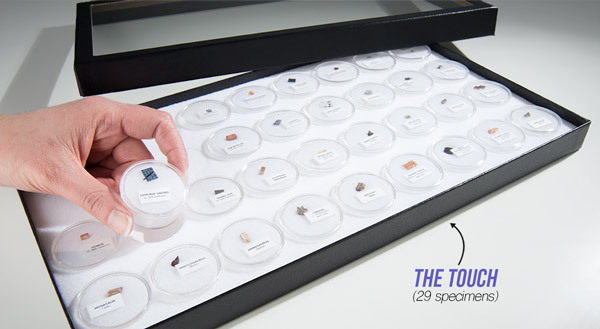 Lift the glass lid of the display box to find each specimen nestled in an individual acrylic protector. Remove the cap and you'll have the chance to reach out and touch fragments of a dinosaur, a piece of the fastest jet airplane ever made, or space rocks older than Earth itself. Question: Where did the materials come from? Answer: Each specimen has its own story, but they have all been curated and identified as authentic. Question: Should I eat the cake? Answer: Eating 40-year-old cake is never a good idea on a personal level, but destroying significant artifacts is generally frowned upon by everyone. Please do not consume the museum specimens.